Cross Trail Outfitters of Illinois - LaSalle Co.
Want to have fun with a great bunch of guys while learning new outdoor skills in a Christian setting? Get involved in the CTO LaSalle County Chapter. CTO is a youth hunting and fishing club for boys and young men age 7-20. We are "Building Men, Preserving our Heritage and Sharing our Faith." Go with us on real hunting and fishing trips and other exciting outings - including the coolest Summer Camps in the world! 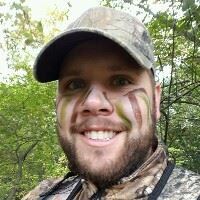 Nate is a husband, father, pastor, and sportsman. He grew up in Minnesota where he developed a love for the outdoors. As an adolescent he learned wilderness camping and survival in the Boundary Waters Canoe Area in Northern Minnesota. In the “land of 10,000 lakes” he learned to fish at a young age. But growing up Nate always wanted to learn how to hunt, but didn’t have anyone to teach him until he taught himself as an adult. Which is one of the reasons he was drawn to work with CTO, so kids can learn to hunt and fish, even if they don’t have parents who can teach them. CTO combines two of Nate’s passions in life: sharing the Gospel of Jesus Christ with all people and the outdoors. He believes that rooting young people in both of these will transform their lives. Nate attended the Association Free Lutheran Bible School in Plymouth MN for two years after High School, and then moved to Eastern Iowa to work as a youth worker. While he was in Iowa he received a Bachelors degree in Graphic Design from St. Ambrose University in Davenport, IA. While in Iowa he met his future wife and was called to attend Seminary. He is currently working through distance education on his Masters of Divinity from the Lutheran Brethren Seminary in Fergus Falls, MN.